"Plate tectonics are essential to life as we know it," said Diana Valencia of Harvard University. "Our calculations show that bigger is better when it comes to the habitability of rocky planets." Plate tectonics -the movement of huge chunks, or plates, of a planet's surface- are crucial to a planet's habitability because they enable complex chemistry and recycle substances like carbon dioxide, which acts as a thermostat and keeps Earth balmy. Carbon dioxide that was locked into rocks is released when those rocks melt, returning to the atmosphere from volcanoes and oceanic ridges. "Recycling is important even on a planetary scale," Valencia explained. Valencia and her colleagues, Richard O'Connell and Dimitar Sasselov (Harvard University), have examined the extremes to determine whether plate tectonics would be more or less likely on different-sized rocky worlds. In particular, focusing on "super-Earths"-planets more than twice the size of Earth and up to 10 times as massive. "It might not be a coincidence that Earth is the largest rocky planet in our solar system, and also the only one with life," said Valencia. Exoplanet searches have turned up five super-Earths already, although none have life-friendly temperatures. If super-Earths are as common as new Kepler data suggests, then it is inevitable that some will enjoy Earth-like orbits, making them excellent havens for life. Recent research indicates that a massive impact may have happened to our planet that may have made the Earth a friendlier place for life because it corresponds with this planet's establishment of plate tectonics. About 3.26 billion years ago, an object between 23 and 26 miles wide (37 and 58 kilometers) crashed into the Earth somewhere and left geological evidence behind in South Africa. Finding the crater, though, is likely an impossible task. There are few rocks of this age on the entire Earth, the notable exception being the nearly 4-billion-old Canadian Shield that stretches across much of eastern Canada. Little remains of that era of history, making it necessary for researchers to do detective work to learn more about the impactor. "It's like the aftermath of a tornado where the insurance company won't pay because your car was sucked off of your driveway and you can’t find the car, so they can’t pay it," said Norm Sleep, a geophysicist at Stanford University who led the research. "You don’t know if it was stolen or damaged or wrecked or whatever because you can’t find it. We have the same difficulty." Sleep and departmental co-author Donald Lowe published their research in the journal Geochemistry, Geophysics and Geosystems in April. The paper is called "Physics of crustal fracturing and chert dike formation triggered by asteroid impact, ∼3.26 Ga, Barberton greenstone belt, South Africa." The only life in that era was microbial, although Lowe pointed out they would have struggled with their new circumstances. "To say the least, it would have adversely affected life near the surface," he said. The Barberton Greenstone Belt in South Africa. Credit: Jesse Allen/Landsat/USGS While whole microbe communities could have been wiped out, on the species level many would have survived. Life was all over the Earth and not just in the area of the impact, and microbes are better able to withstand sudden temperature changes than more advanced lifeforms. Perhaps microbes would have suffered after the impact, but in its wake, the impactor could have helped change our planet into one that better supports complex life. Lowe pointed out that plate tectonics seems to have appeared around 3 billion to 3.2 billion years ago, around the same time the impactor smashed into the Earth. Huge as it was, the impactor was probably too small to have affected plate tectonics all over the Earth, said Lowe and Sleep. In the local area, however, it could have caused great upheaval. Moreover, the impactor crashed into the Earth during an era known as the Late Heavy Bombardment, when rocks and comets smashed into our planet and all the other ones. The Moon still bears scars from that time. The Earth's have eroded away, but the effects may still linger. If enough big objects hit the Earth frequently enough, it could have broken up the primitive plate structure on our planet into the plate tectonics we have today, they said. This has important implications for life, as other researchers have said that plate tectonics might be necessary for complex life to exist. In 2009, Tilman Spohn, director of the German Space Research Centre Institute of Planetary Research, argued that plate tectonics replenishes the nutrition necessary for life. Rubbing plates together, pushing plates below each other, or raising them up would have mixed the chemistry of the Earth, providing fresh material to counteract what had been eaten up by bacteria on the Earth's surface. Lowe found the possible "ground truth" of an impactor in the Barberton Greenstone Belt, where he has spent summers for decades. Barberton is named for the nearby eponymous town in South Africa, which is located about 250 miles (400 kilometers) east of Johannesburg and a little north of the Swaziland border. Barberton was a popular location for gold seekers in the 1880s, but more recently it has been harvested for its biological and geological features. Rocks in the region are around 3.5 billion years old, and host fossils of microscopic life that likely exceed 3 billion years. "It's one of the few areas on the surface of the Earth that preserves sedimentary layers this old," Lowe said. The sedimentary layers are important because sediments show biological activity that took place at the Earth's surface where microbes exist, especially those performing photosynthesis. About 30 years ago, scientists discovered layers of small particles with "strange properties," Lowe said. These were formed by the condensation of liquid rock droplets. Further analysis showed they were rich in iridium. Iridium is a rare element on the Earth's surface today and was one of the indicators scientists used to identify the K-T Boundary, the layer of material left after an impactor probably killed off the dinosaurs about 66 million years ago. More recently, Lowe's group identified eight layers in the particles that impactors likely created. The paper focuses on one of those layers. In the field, Lowe's group collected spherical particles the size of a grain of sand that were abundant throughout the layer. Further examination in the lab revealed they were rich in iridium and platinum, both common meteorite elements. Another clue came from the isotopes (types) of chromium. The surface rocks on Earth have a uniform ratio of chromium isotopes, but Lowe and a colleague in San Diego found that the isotopes in this layer had a different ratio. The unusual proportions, along with the iridium, the platinum and the widespread distribution of the layer, all suggested this was produced by an impact. "In the area around a crater, the rocks of this age would have been destroyed," Lowe said. "We’ve never found evidence that we were at or close to an actual crater." Crustal plate boundaries showing plate tectonics on Earth. Credit: NOAA Perhaps further examination of the greenstone will turn up more information on this impactor, but similar sites will be hard to come by. There are few regions like the Barberton around today, so that scientists will have trouble finding other impactors that could have affected plate tectonics. Even if the impactor did break up a primitive solid crust into plate tectonics, it's unclear how necessary plate tectonics is for life, Sleep said. "Part of the handicap is we only have one planet in the Solar System where we have plate tectonics, where it is occurring now, and any evidence for it on Venus and Mars is at best very tenuous. We think it’s likely to occur on other objects, but we don’t really know," Sleep said. 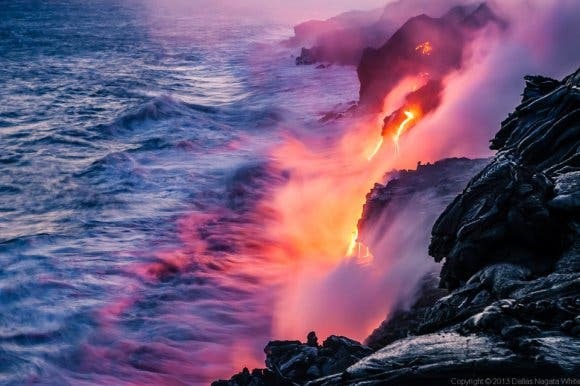 Life on Earth is also adapted to plate tectonics, he pointed out, and as we have not found life elsewhere it is hard to say if tectonics are necessary for life to exist. Even when looking outside of the Solar System, it will be a challenge to detect plate tectonics on extrasolar planets because they are so far away. Image credit top of page: sharenator.com"
Weekend 'Galaxy' Insight –"We May be One of the Early Advanced Species in the Universe"